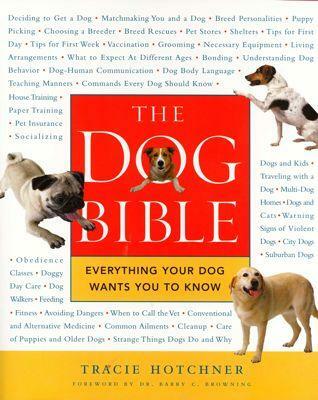 The Dog Bible is one of those books that you need to have on hand for quick reference, much like a dictionary or a first aid book. It doesn't matter if you've had dogs your entire life or if you are getting your first puppy and have no idea where to begin, The Dog Bible has something for you. 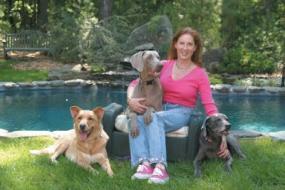 The author of The Dog Bible, Tracie Hotchner, began her writing career in the '70s as a research journalist. She wrote articles for the now defunct New West magazine. This work made her an expert in researching topics. As she researched a particular article for New West, she came to the realization that pregnant women were not being provided with the information they needed in order to have safe, rewarding childbirth experiences. This brought her to write her first book, Pregnancy & Childbirth. Tracie says, "With the naïve enthusiasm of youth, I decided to write a book to set everything straight. In my mid-twenties with no medical background of any kind and never having been pregnant, I did the groundwork for a book proposal on what I said would be a 350-page "everything you need to know" sort of book. The book wound up being 700 pages long and sold one million copies. "She went on to say, "I was young and believed innocently that knowledge is power, and that consumer choices in a capitalist society can actually change the way medical care, or any other service is delivered. In fact, I discovered as years went by that I had written a book that revolutionized how maternity care is practiced in this country." Being an animal lover, Tracie wanted to do the same thing for pets that she had done for parents and began research for The Dog Bible. Recently, LoveToKnow was able to catch up with Tracie to discuss her book as well as her thoughts on caring for the the dogs we all love. Why did you write The Dog Bible? I wanted to do for dogs and their human families what I had done for pregnant couples - empower them with the unadulterated truth and facts on every aspect of the canine-human shared life, and then let them make good decisions for themselves. What I discovered in both books (and The Cat Bible that followed) is that you should never underestimate the intelligence and moral/ethical strength of the average person. I researched The Dog Bible with the same starting attitude as Pregnancy & Childbirth which was to presume I knew nothing at all. I discovered disturbing and startling facts that contradicted many of the ways we nourish, train and co-exist with our canines. The Dog Bible has made me a guru to many pet parents in the way that parents-to-be used to turn to me for honest, reliable advice that may fly in the face of convention and even contradict the opinion or advice of professionals. Is this book for canine novices or old hands? The comprehensiveness of the book makes it suitable for people who don't know one end of the leash from another and need practical advice and guidance on everything from puppy training to geriatric problems to nutrition. This includes behavior problems, multi-dog households, the arrival of a baby, etc. People who are lifetime dog owners also say it is a great resource for them because they have never questioned many of the accepted practices, especially around nutrition and vaccinations, and the book has really opened their eyes. What type of information is in The Dog Bible? The better question is what is not in the book! I'd welcome suggestions about anything I left out. I am such a compulsive that I even paid double to get an improved index so that every little thing in the book would be easier to find. I do not believe I left any stone unturned. Training, medical, canine personalities, how to go about adopting, choosing a breeder and grieving (yours and your pet's) after a loss are all covered. What is the most common dog health issue and why? Skin problems are rampant. Like many of the other medical problems, they stem from feeding dogs exclusively dry kibble as strictly instructed by their vets who were themselves strictly taught this in veterinary colleges! We have to break this cycle where the commercial pet food companies are the ones determining how dogs should be nourished. We are what we eat, so the more balanced and varied and closest to its natural state a food can be, the healthier the animal will be. Loads of dogs also have digestive issues that can be attributed to feeding highly processed carbohydrates made from suspicious sources. What do you recommend feeding dogs? My passionate dedication to research and drawing intelligent conclusions about canine nutrition is probably what has gained me my growing reputation. All questions I ask callers begin with "What are you feeding? ", and a great many problems are solved right in the dinner bowl. In a nutshell, the self-evident facts and recommendations I make about feeding dogs are generally opposite to the common assumption that a dog should eat only kibble - and often only one brand of dry food, which is highly processed carbohydrates - for her entire life. Dogs are omnivores and need a varied diet containing many food groups. The first is a quality protein source like Spot's Stew that uses only "fit for human consumption" meat, or Newman's Own that uses Organic Chicken, or Weruva that makes the hands-down finest canned cat food and also has some pretty awesome flavors and styles of dog food (all from verifiable sources). Also, I often use any left over fish, meat, chicken or make scrambled eggs, cottage cheese or canned sardines equaling roughly ½ to 1 cup at each of two daily meals. I do all of the above and rotate the protein. A dog also needs some vegetables and simple carbs for roughage and nutritional balance. For vegetables, I use either Dr. Harvey's dry pre-mix (intended to be rehydrated with warm water and used with freshly cooked meat) or The Honest Kitchen's raw dehydrated food containing not only protein but also the vegetables known to be good for a dog's digestive requirements. Next, I serve a small portion of dry food because I believe that a small side portion of top quality kibble gives dogs a feeling of fullness and satisfaction along with nutrients they need. It has to be a really good kibble; again, I have found that Spot's Stew is head and shoulders above all others because they are so strict about the origin of their meat - no rendered meats, no meat meal, no by product. It is all fit for human consumption. When Spot's Stew uses liver, it is "butcher quality". Lastly, you must add omega-3 oils to a dog's food bowl because all our diets are deficient in these essential fatty acids. Nordic Naturals is a small private Norwegian company with a dedication to freshness and purity equal to that of the Norwegian government. I consider buying any other brand a potential waste of my money and time along with the risk of the oil being rancid or impure. How can you be sure your dog food is top quality? Learn what all the words on a label mean - what they really mean - (The Dog Bible explains all those confusing terms), and then ask me on the air or in an email! Ask questions of the company too, but realize that if you don't know what to listen for, if you don't know where all the fiddle-faddle exists in the commercial pet food world, you may not realize that the answer you have gotten is incomplete or self-serving. I think what has gained me such a following is that I cut through all the "noise" for people and help protect and guide them to good options. I started Dog Talk as a pod cast out of my house. It cost me a fortune because I was paying a friend to be a co-host. But when I proposed it to my then-local NPR station WLIU at Southampton College, New York, the wonderful manager, Dr. Wally Smith (who had run one of the most successful NPR stations in the country at USC in Southern California) took a risk and invited me on his station. And the man doesn't even have a dog! Dr Wally is a "cat person", but he apparently could tell from my passion for information and integrity - and my celebration of the animal-human bond - that I would connect with listeners. So I have a live, weekly, hour-long show with a toll-free call in number. It has become hugely popular. People are listening live online Saturdays at 11 am EST on Radio Pet Lady. I have extraordinary guests, from world-renowned vets on every possible medical issue to trainers and authors. I even have a monthly animal communicator, Ann Marie Sawicki, on the first Saturday of every month. I am a total skeptic about anything I cannot see or explain, but it's one of the most popular features of the show, actually. What do you wish people knew about their dogs? I wish people could give their dogs more physical and mental stimulation and challenge. Too many dogs sit home for endless hours with nothing to do - bored, depressed, anxious, even angry. They need to get out more, go more places with people or have doggy day care. Schedule play dates with other dogs, and do anything you can do to restore some of their true "dogness" to their lives. Don't keep them as hothouse flowers. Dogs need to run, play, chase, lie in the sun and gnaw on things. We need to provide ways for them to explore their own true natures. Then they can be fulfilled and relaxed in the time we share with them. LoveToKnow would like to thank Tracie Hotchner for taking time out of her busy schedule for this interview. For more information on Tracie, The Dog Bible, her other book The Cat Bible or Tracie's radio show, visit Tracie's website, TracieHotchner.com. Here you will find a lot of helpful information as well as her radio talk show schedule and a link to follow Tracie on Twitter.